Yeah. This is how clueless I sometimes (okay - often) am. In the spring of 2013 (yes, that's more than 3 years ago), I saw a slideshow of The Duchess of Cambridge in her glorious, impeccably-tailored outfits. Which reminded me that I had a wedding to attend in June later that same year, not that I saw myself looking anywhere as svelte as TDOC. 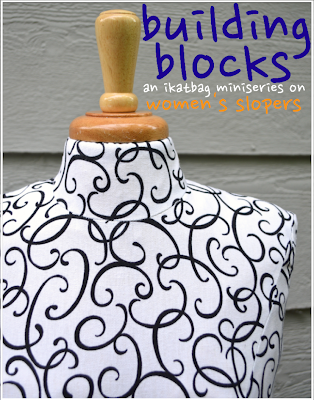 Which reminded me that I couldn't sew a dress for the wedding until I'd updated my blocks/slopers. Which I did, using chocolate and shame as positive and negative reinforcements, respectively. The process of which I sketchily documented on the blog in the form of several very long and technical posts designed (albeit not intentionally) to bore most people to death. After which I felt maniacally motivated to make myself a collection of workable blocks for a full arsenal of garment-making templates. 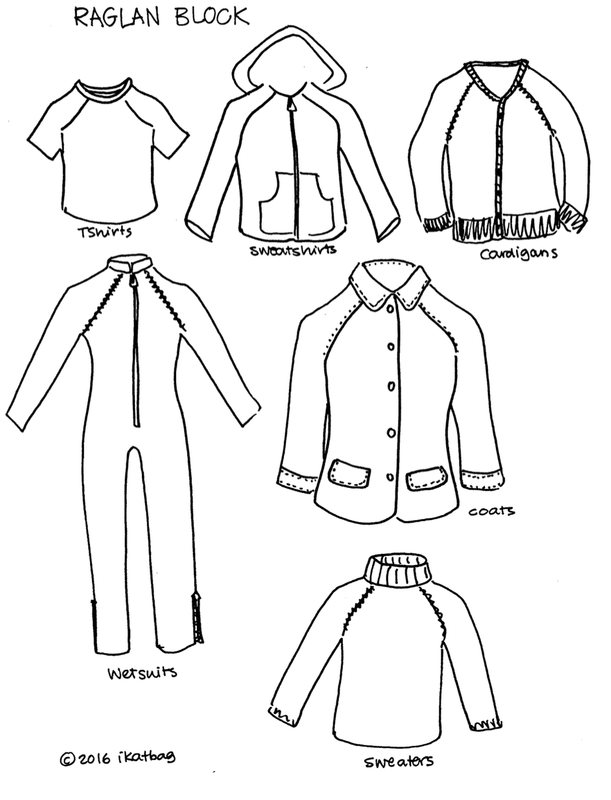 Which I then felt compelled to exemplify and illustrate as finished garments. The insanity of which I justified by telling myself that it was all for the sake of sewing a dress for the wedding. All those posts later, I realized I'd unintentionally written a sort of a drafting miniseries. So then I slapped myself on the forehead and said, "Fool. If you'd actually acted a bit more clairvoyant, you could've made a button and a grand announcement beforehand and stirred everyone into a frenzy of anticipation and gotten to use about a hundred exclamation marks (or exclamation points, as they say in this country), plus the words, 'Whoo!' and 'Excited!'." In keeping with tradition, this post will be the epilogue of the series, containing all the links to the earlier chapters. And here are a couple of posts in which I reviewed very fundamental drafting books that I've found useful. 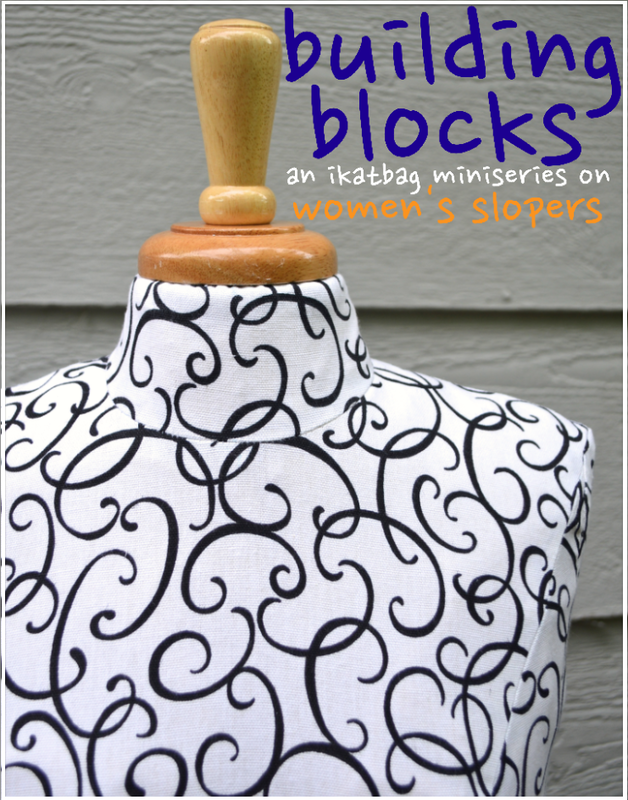 They are mostly out of print (sorry) but I like them because they focus on drafting slopers and basic blocks step-by-step from body measurements, which in the more modern, more comprehensive drafting books, is glossed over in favor of just adapting those slopers and blocks for dress patterns. Click on the book images to go to the individual posts. Note that while this was a series on women's slopers (aka foundation blocks), it does not contain a drafting-from-measurements component because I didn't have anyone to measure me accurately enough to draft any of my slopers from my vital stats. Fear not - you can read supplementary drafting-from-measurements material I wrote in my earlier drafting series here. While it was for children, the process and sequence are exactly the same for women, except that there are darts in the front and back bodices in women's blocks. Hopefully, the bit of dart manipulation - creating, shifting, pivoting, closing, merging, enlarging, decreasing etc - in this series will fill some of the gaps in the children's drafting material to help you make the jump to women's blocks. Another reason for actually coming right out and calling this an intentionally educational (rather than random soapboxing) series of posts is the odd treatment of material itself. I have seen numerous posts on the internet that cover drafting a darted sloper from measurements as well as those that show how to adapt such a sloper to various sewing patterns with fancy features. However, I haven't seen many (if at all) that show the transformation of one kind of block to another kind of block from those same measurements, to build a collection of different foundational slopers from which to make an entire wardrobe of garments that utilize the unique qualities of different fabrics (e.g. stretch, bias-layout, woven, etc). Whew - long sentence there. Most people I know would not sew this way, with the exception of the people in my family and - I'm extrapolating -culture. 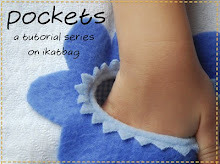 If, however, you do, you might realize that the different blocks are specialized enough that, unless you want to draft a brand new block ( first, and then the actual sewing pattern later from that) for each garment you make, you might save time by having these four basic blocks on hand. 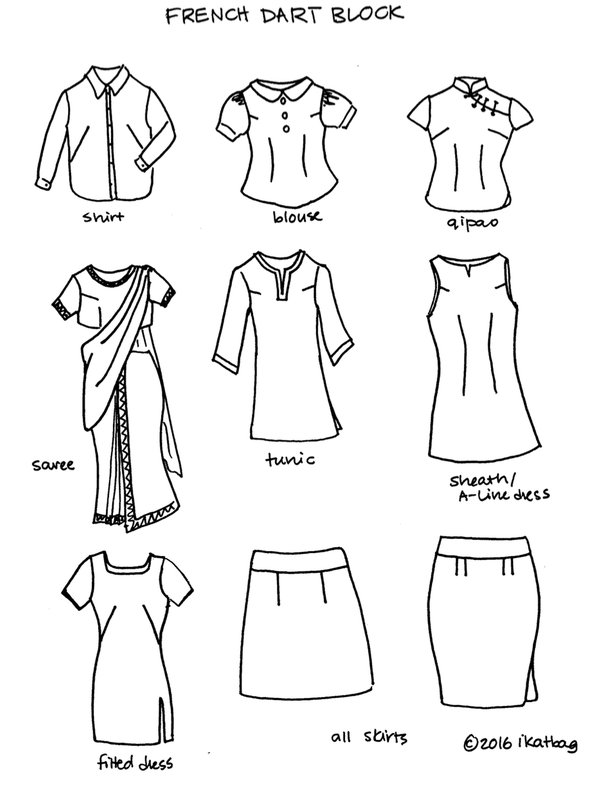 French dart block: most basic blouses, button-down shirts, qipao tops, saree tops, tunics, shift dresses, all skirts. 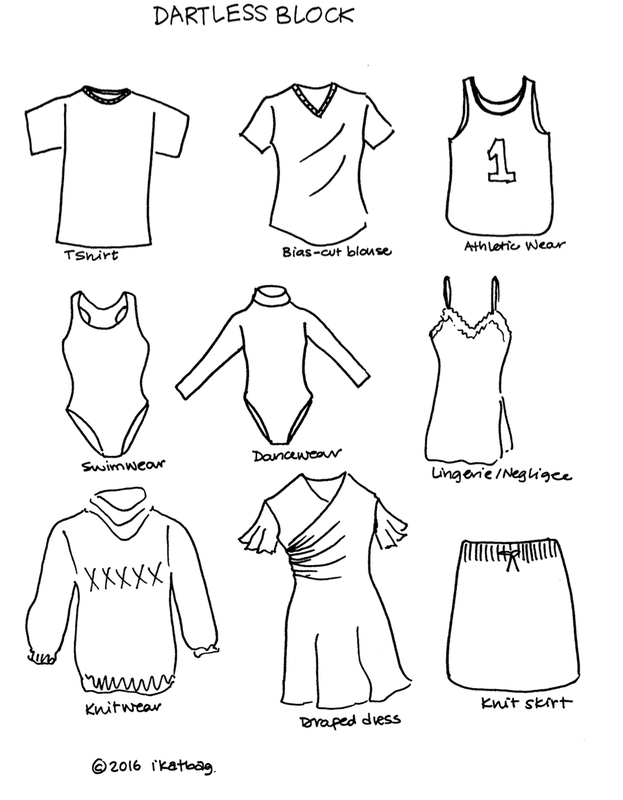 Dartless block: bias-cut tops and dresses, lingerie, negligee, Tshirts, athletic wear, swimwear, dancewear, knitwear, draped-bodice dresses and tops, knit skirts. Raglan sleeve block: raglan-cut garments e.g. athletic wear, dancewear, swimwear, wetsuits, coats, sweaters and other knitwear. I realize that this is probably more technical than most home seamstresses would need, particularly if you are used to only sewing with commercial patterns. For that reason (and also it was too much work to cover the rest), I chose to spend a bit more time on the more familiar parts of the fitting process - the bust and back darts and the sleeve caps. From what I've heard through the grapevine, these are the areas with which people commonly have trouble when they adjust their commercial patterns to fit. That said, I want to make it clear that I don't think commercial patterns are bad - but you must remember that they are drafted for industry-standard dimensions (i.e. arbitrary) and you can be 100% sure they will need some adjustment to fit you because your body is real. I also believe that anyone who uses commercial patterns needs to learn how to fit them properly and to visualize how those fit-changes will look like on paper, and vice versa. That visualizing is the only way for you to precisely adjust your paper patterns to accurately reflect those changes. Otherwise, all you're doing is blindly following a method, like a recipe you've never actually tasted but hope works because someone else's tastebuds raved about it. One of the unwelcome side-effects of becoming increasingly familiar with visualizing fit issues is the unwanted awareness of both good and bad fit in garments on strangers. It can feel a bit like a curse! There have been times when I am, say, sitting on the train, all placid and at peace with the world, when I suddenly notice that the lady in front of me has an unfortunate armhole. Instinctively, I avert my eyes because I immediately sense her discomfort at how much it must be pulling at her armpit, poor soul, or how self-conscious she must feel each time she has to tug her garment down because the sleeve cap has peaked again. I want to go up to her and pinch a half-inch dart at her shoulder and see her smile in relief, as if I'd just administered the clothing equivalent of Tylenol. But it's none of my business, of course. And I'd probably get clobbered by her rather large handbag (gussetted, partially-reversible, four purse feet, with buckled open-ended straps and one external patch pocket with lapped zipper*) which I'd completely deserve. So I just sympathize and say nothing. So be warned, friends: draft and fit enough garments and you might develop this uncomfortable Sensitivity to Strangers' Unfitting Clothes. The good news is that you can learn to live with it. Sometimes you even get good enough at living with it that your own standards drop below rock-bottom. Remember this shirt? And just the other day, I stood in the fitting room in Target and tried to convince myself that a dressing gown with a gaping neckline and shoulders squarer than a robot's was "okay because it's only $22 and made of T-shirt fabric so it can probably stretch to cover whatever it needs to if I breathe in continuously and hold it real tight around my body with both hands." Long ago when I wrote this post and asked for suggestions on what kind of curricula you guys wanted me to write here, some of you asked for drafting posts for women. I'd always thought it would be awesome to do that but there is so much information, much of which would be far too technical for folks already sold on the commercial pattern way of sewing. So I didn't address it until I felt I could share information more immediately practical to any seamstress who'd ever made a garment (and not only the hard-core drafters). Hopefully this series has helped do that. Thanks for coming along for the ride! * My other curse is Seeing Bags With X-Ray Vision. I got Dorothy Moore's book on your suggestion about a year ago. I have to say I've been pretty let down by commercial patterns, and when I envision the kind of seamstress I'd like to be, it's essentially what you've described. Several different foundational blocks that can be adapted. Nearly all of what I know about drafting comes from your blog and that book. I loathe (loathe loathe loathe) buying an expensive indie pattern that's been raved about, make it, have it not fit, and not be sure how to fix it because I lack the ability to look at a flat pattern and see how it might not fit on my body. I want to START with my body and make patterns, that fit it, not start with patterns and try to superimpose my body. Anyway, a long-winded way of saying thank you! Everything you said MayravB - I feel exactly the same way. Exactly. Ha! Your fans have long known that you wrote an excellent series on drafting for women, with application to children and men as well. Thank you. I am constantly amazed and grateful for your work and your writing. Thank you for making these technical points all seem so wonderfully clear, and making it such an awesome resource for all of us! You're my heroine. For reals. Although I have much less skill at sewing and alterations than you have, I also notice clothing style and fit. Part of it might be that my grandfather was a tailor; many years ago my daughters came home from school complaining about a staff member who told them they should dress more fashionably; this fashion conscious individual apparently did not realize that she was wearing an expensive plaid outfit with mis-matched side seams! They learned from his example. You are the most generous rock star in all of blogland! Thank you, thank you! You made me laugh out loud with the your notice of the fit of garments on random strangers. I was an ICU RN for a long time and I STILL notice who has good veins and who I'm glad I'll never have to stick for an IV. Thank God the world is spacious enough for all of our quirks! I, too, have the Sensitivity to Strangers Ill Fitting Clothing curse. Church is the worst - your mind wanders as you assess all the people's clothing as they usher past your pew up to communion. All those ill fitting clothes (not to mention the too short skirts, but thats another story) lined up as if begging for inspection! "okay because it's only $22 and made of T-shirt fabric so it can probably stretch to cover whatever it needs to if I breathe in continuously and hold it real tight around my body with both hands." made me laugh. LiEr, I am so glad that there are delightful bloggers like you on the internet! I think your drafting series is absolutely fabulous. I need to make some time to go through it so that my clothes can start fitting. Thank you for this really interesting drafting overview! Exactly what I needed. Lots of love from Belgium! I remember some of this from before but now the timing is perfect. I mainly sew with commercial patterns but I've been so dissatisfied with shoulder/armscye fit lately. I think I'm going to go the sloper route and see if I can figure it all out. Your blog is such an awesome resource! Thank you! Thank you Lier. I am very appreciative of the time you've invested into providing this sloper drafting information. 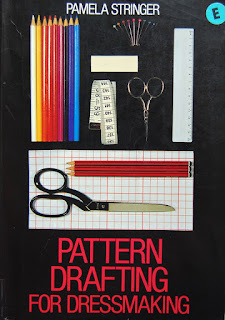 Many many years ago I took a night school class on pattern drafting. I loved it but am rusty on some of the finer points. Your posts will remind me of what I've forgotten. Many thanks! You have actually written a great drafting series, thank you! not boring and definitely easy to learn from. i have long put off drafting things for myself, instead using commercial patterns and pre-existing clothes as templates -- all shapeless/tunic-y tops and knit pants with elastic waists. I have little reason to dress otherwise, but it might be nice to attempt it. Seriously Lir, I love you so much it's not even funny. You are the women I aspire to be when I grow up, although I don't think I'm ever going to grow up! I love how you go into the whys and hows and deepen my understanding of of this cool (but tricky!) skill. Thank you so much for putting so much effort in for us undeserving plebeians! Granted, I don't know if I'll ever be really good at it, but thanks to you I have some really great foundation skills. *jokes* I live in Michigan and sometimes day-dream about going on a pilgrimage (aka road trip!) to petition to study under you the way people a hermit/monk/sensei! Hilarious! Thanks for the generous knowledge transfer. I have up on commercial patterns 10 years ago after a bad bridesmaids dress experience. 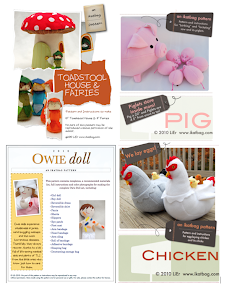 I won't have time to sew for myself for a while yet, but I will definitely come back and reference your posts! I see ill-fitting bras and shoes. Everywhere. I feel like the kid from The Sixth Sense. Generous and kind as always. And I see offgrain drag lines. And when I get bored at the theater or the movies or the library, I see poorly made hems. I found your drafting posts not long ago... and have read them over and over and over, much like a parched stranger in a desert finding an oasis! 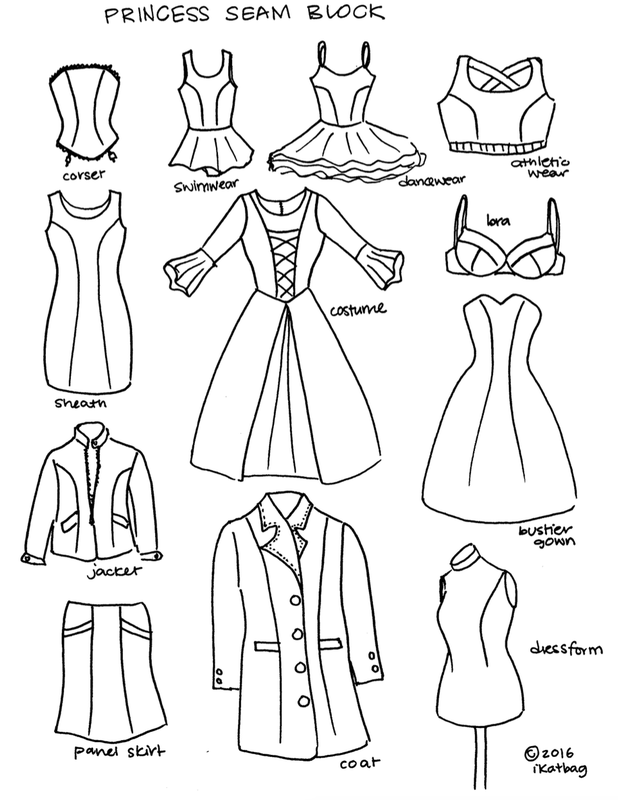 THANK YOU so so so much for the effort you have put into these posts - and any thing else you EVER want to write about drafting / sewing / alterations / using slopers whatever will be eagerly soaked up by many of us. I found them because of my frustration with fitting sleeves (BTW the post where a visitor comes to you upset about stinky sleeves had me laughing till I cried). Realizing how incredibly spot on your information was, I have already bought the two books you recommended and have every one of those posts bookmarked. My biggest complaint... I now have a pile of more recently published books that I no longer trust. Having gone back through several of them - I've been sorely disappointed to realize how many of them draft sleeve caps to be exactly the same front and back! No wonder I kept having problems! So much money wasted on classes / books that never addressed the real problem.... sigh.... you are so so so very fortunate to have grown up with wealth of experience shared by your family members. Can't tell you how much I would LOVE to just watch you work for awhile, knowing I would learn so much. Your daughters are very fortunate! 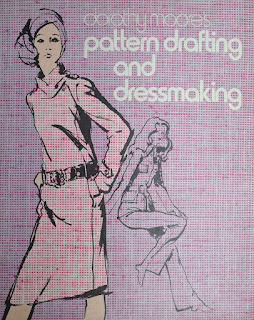 Oh man - I don't sew from commercial patterns either, and your drafting series has been a godsend. I have a couple of drafting books, but I love the way you explain the reasoning behind things. I learned to knit sweaters from Elizabeth Zimmermann's books and the way you write about sewing is similar. If you ever decide to turn your series into a book I would totally buy it. I bet a lot of other people would too!